The ‘Villages.’ Everyone has heard of the Villages, at least those more senior among us. And, you don’t have to live in Florida to know about this place. It is really hard to describe, a mecca to some, and a destination for many. GatorMOG has a presence there and so a quick jaunt up to visit, mid-week, should be fun! Well, it was just a sleepy Wednesday morning in the Villages? Or so it was supposed to be. A few of the otherwise uncommitted GatorMOG traveled north to see the sites, but more importantly to send Allan and MaryAnn Rae off, as they head back to Canada later in the week. Having the Morgans in the Villages was big doings for the locales. Lots of verbal compliments and lots of cell phone photos. The road designer must have been enamored with the British mode of traffic control, the roundabouts, with only a few traffic lights in the entire town! The Morgans were right at home!! 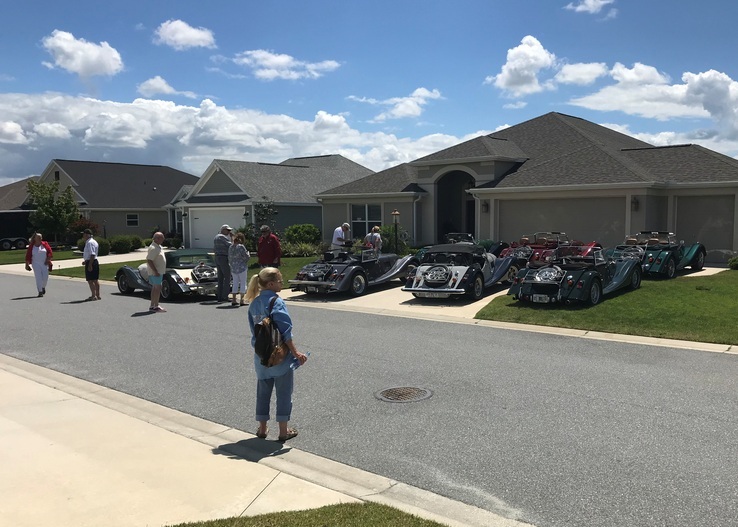 As Morgans meandered through the many roundabouts of the Villages, we attempted to see what we could. Lots of golf courses, tennis courses, swimming pools, recreation centers, boutiques and restaurants. This place has everything! We milled around, visited a few shops and found lunch in one of the many restaurants. We sat outside and looked at one of the lakes that surround the Villages and watched the bird. Perfect weather! Then a short drive to Allan and MaryAnn’s Villages home for dessert and Lemonade. It was hectic driving, however. We had to dodge the many residents in their golf cars or mini vans as we went. It would appear that this isn’t just a place for lethargic retirees. Folks in the Villages have things to do, places to go, people to see! And, they’re in a big hurry! Photo Courtesy of Rick Frazee. Thank you!